Google is always looking for ways to improve its Google+ service. Whether it’s fixing bugs, listening to user feedback, or creating new subsections within the program, Google is invested in its social creation. Today, the company’s adding another facet to the Google+ diamond, but, this time, its coming in the form of an entirely new service. The appropriately named, Google Mine, will help you keep track of items you currently own or would like to own in the future. Think of it as a “Pinterest” or “Wish” type service, with the added benefit of showcasing things you’ve already obtained. In true social form, your friends will be able to view your lists and comment on specific items. With this new service, you’ll be able to catalog your belongings and track what you already have. You’ll also be able to get recommendations from Google about products that you may enjoy based on the objects you already own. Viewing your friends lists is also possible, and you can even send requests to them about trying out or borrowing a specific item they may own. Of course, there are privacy settings, so you can define who’s allowed to see your lists. This tool can also help you get rid of some of the unwanted things you have lying around your house. Google Mine offers a nifty tool that allows you to mark an item as a “give away” object, so your friends or others can see what you’re trying to get rid of. There is no word on whether or not you will be able to use this as a “marketplace” to sell goods, but judging by the “borrow,” or “give away” theme, it is safe to say that isn’t permitted right now. 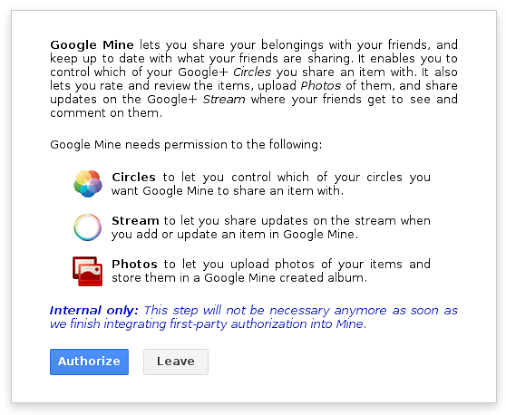 Currently, Google Mine is being tested internally, but we should see a potential launch date for this service soon. There is also an Android application for the service that is available on Bazaar, which is Google’s internal Play Store, so we can expect to see this program hit Android as soon as it’s available. If you’re interested in seeing a list of potential development commands, as well as some of the icons that the program will be using, be sure to check out the Google Operating System unofficial blog.